Is Trump Draining the Swamp or Filling It? Trump has broken his word and is by no means draining the swamp — he is filling it. He has really betrayed a lot of people by his nomination of Gary D. Cohn as Director of the National Economic Council, which is a policy-making position for domestic and international economic issues. The one legal firm in New York that defends the bankers is Sullivan & Cromwell. Trump has named a lawyer from that firm, Jay Clayton, to serve as Wall Street’s top cop as Chairman of the Securities and Exchange Commission. There is absolutely no possible way Clayton will call the bankers to account for anything. In fact, it would probably be a huge conflict of interest to bring charges against any bankers in New York when Sullivan & Cromwell will most likely represent them (including Goldman Sachs). 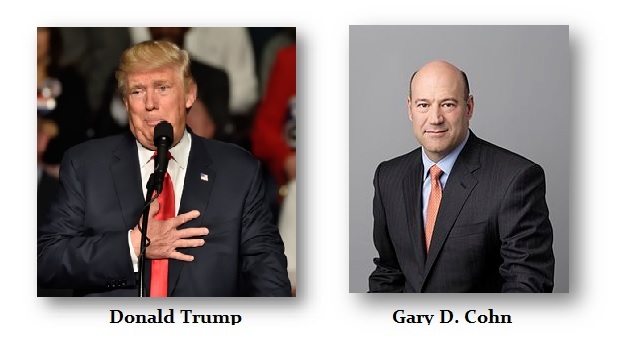 I am much less concerned about Steven Mnuchin, who left Goldman long ago, than I am with Cohn and the appointment of Clayton. Jared Kushner, Trump’s son-in-law, is a close friend of Cohn, and he set up the first meeting with Trump. I do not see how he will “drain the swamp” with ties to Goldman Sachs. These appointments are no different from Bush, Bill Clinton, or Hillary Clinton. I remain skeptical at this point of any real reform in the swamp. So for all those who have sent emails betting on me advising Trump behind the scenes simply because I was seen walking into Trump Tower a few weeks ago: 1) I was not there to meet with Trump, and 2) I would be outnumbered by his Goldman advisers, so why bother? Sorry — I have no interest in getting involved with this crew. I do not want to have to count my fingers, assuming I even would shake hands. There is no way Cohn would let me advise Trump on anything. Goldman Sachs always weasels into the White House. Here they funded Hillary, denounced Trump, yet have still taken over the White House. They are the masters of the universe – unbelievable!